Do You Know Imam Jamil Al Amin? 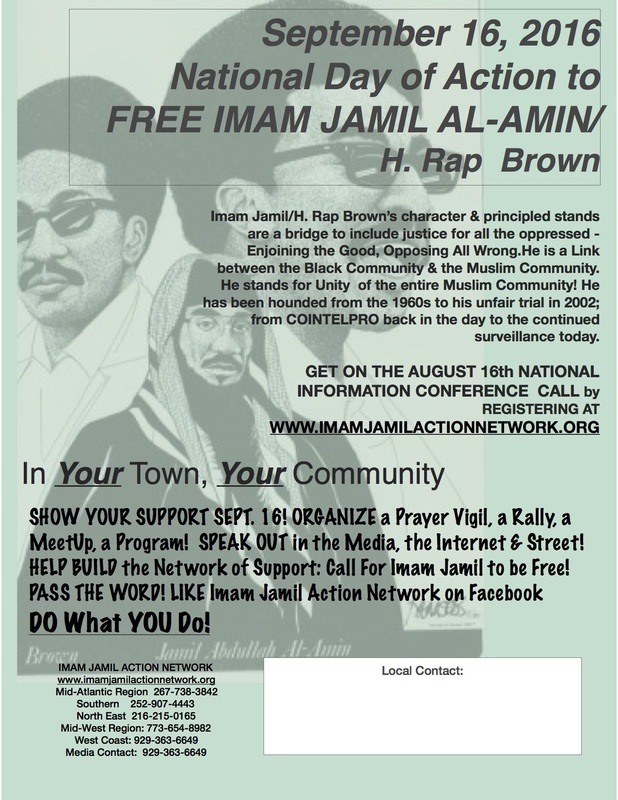 4 things to do to show and build support Imam Jamil and all political prisoners / prisoners of war. 5. Announce the dinner fund raising dinner on the following night. 5:15 PM Close it down. 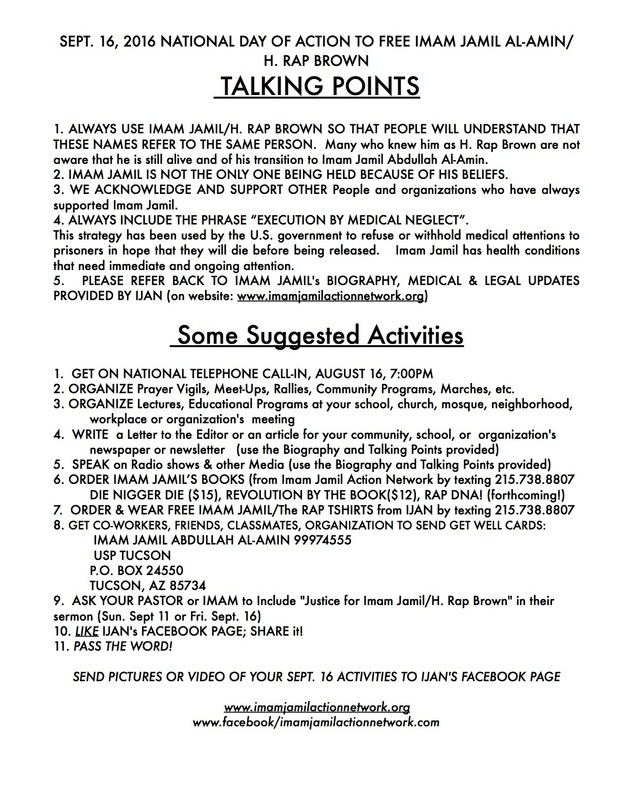 September 4 2016 - It is now easier for people to find the Imam Jamil Action Network IJAN page in Facebook search. People can also visit the IJAN Facebook Page at fb.me/IJAN.ImamJamil and send the IJAN Page messages at m.me/IJAN.ImamJamil. Peace be upon you and the blessings of Ramadan. The above Surah (Al-Ikhlas) is the root of our faith. And we bear witness that there is no God but Allah. He is One and alone, worthy of all praise and worship. And furthermore, we pray that Allah's peace and blessings be upon His last prophet and messenger, Muhammad, son of Abdullah, and his family and those who follow him. I seek Allah's protection from Satan, the rejected. I ask Allah to guide my heart and to guide my tongue. I seek refuge in Allah from misleading and being misled, from betraying and being betrayed into ignorance by others. May these few words that I offer be a warning to the heedless, a guide to the erring, an assurance to those in doubt, a solace to the suffering, a hope to the despair and glad tidings to the believers. Than to live and die a slave. They are trying to get you to go against the Qur'an. There are no new answers to old problems. Tyranny and oppression is worse than slaughter, so fight them wherever you may find them. Common struggle (to get the money, etc) is not sufficient. We have to begin to be conscious in our struggle. Allah does not change the condition of a people until they change that which is within themselves. Truth smashes the brains out of falsehood. Truth comes and falsehood is vanquished, for falsehood by its nature is bound to perish. We live in a land that has said that freedom is the pinnacle of its moral argument... that life, liberty, and the pursuit of happiness its banner of moral authority, that there is free speech, but I am still gagged and prevented from declaring my innocence. They speak to me of religious freedom, but I am not allowed to pray according to my faith. They say they guarantee life, except Roe v Wade, liberty is guaranteed, but not for the ex-slave and Native American. Their pursuit of happiness is always at the expense of the poor. Can you see? Justice and law march to two different drummers, two totally different conversations. Now, the rights you thought you had will be taken away. Huey P. Long, a former governor of Louisiana was asked, " Will fascism come to America?" He replied, "Yes, but it will be called patriotism." " Shepherds may change, but sheep will always remain the same." We, the Muslim, should not complain about our situation. It is the decree(Qadr) of Allah. If Allah is not displeased with us, then we should be pleased with what Allah has decreed for us. We ask Allah to protect us from the evil that they bring and give us the good. We seek refuge in the honor of Allah and His power, from the evil, which we find and watch out for. Nothing can or will happen except by Allah's leave. He is the Lord who delivered Abraham from the fire, save Lot from Sodom and Gomorrah, sustained Noah through the flood; released Joseph from prison, saved Moses from Pharaoh, caused David to slay Goliath, cleared Jesus of the blasphemy of the disbelievers, and gave light to His prophet, Muhammad, so that his was a manifest victory. It is to this Lord that I turn. Empires rise and fall, worldly powers can and do defy right, and misused intelligence (intellect) may obscure Allah's light. but Allah in His good time separates good from evil. I believe, both by certain faith and by intuition, that there is no power and no might except with Allah, The High, The Mighty. I pray that Allah The Almighty will number me among those whom He has chosen and elected, whom He has led to the truth and guided, whom He has inspired to remember Him and not forget Him, whom He has preserved from the evil in themselves so that they do not prefer anything to Him, and whom He has made His own so that I serve only Him, and that He give the grace to lead the righteous. In Peace, Strong! In Battle, Strongest!